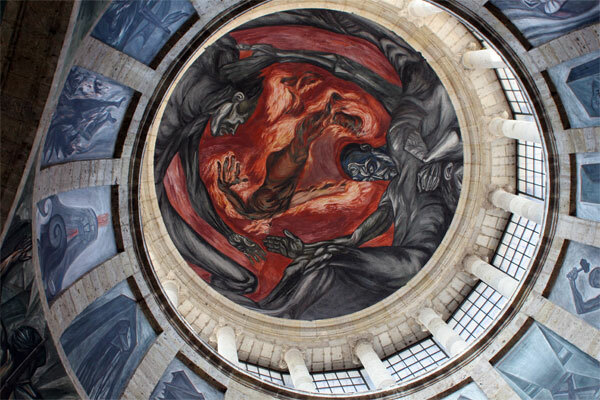 When José Clemente Orozco looked up at the chapel dome of Hospicio Cabañas, a grand colonial building that long housed an orphanage in Guadalajara, he knew he had a challenge on his hands: to paint a dazzling mural on a curved surface 60 feet above a viewer’s head. 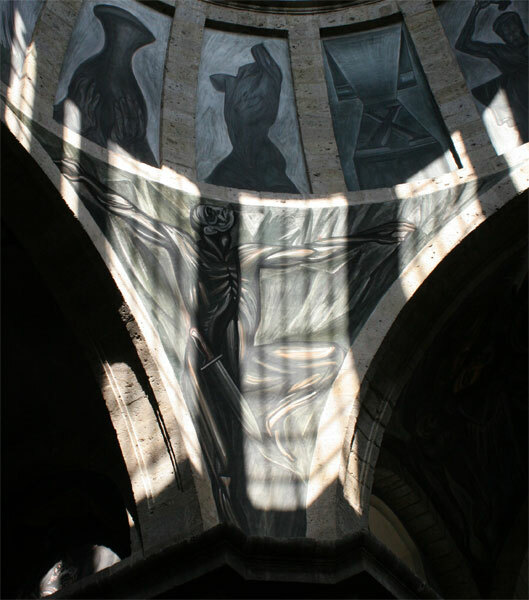 The mural in the main dome of the chapel here is called The Man in Flames, and it is a masterpiece. 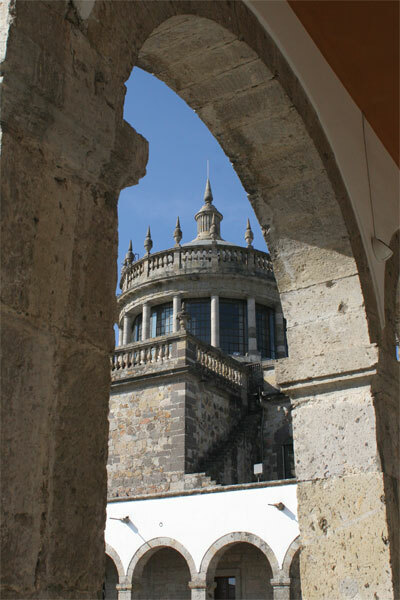 Orozco sought a strong sense of perspective on that curve, using it to create three dimensions. A man surrounded by fire appears to rise into the heavens over three figures encircling the rim of the dome. Streams of sun light other murals — of muted grays and blues — on the lower part of the rotunda, making the fiery red above seem ever more ablaze. 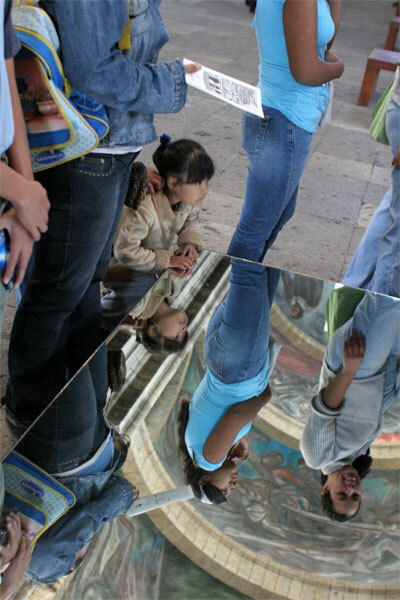 A square mirror about eight feet wide on the floor beneath the dome allows the eye to linger on the paintings and take in the images without craning the neck. 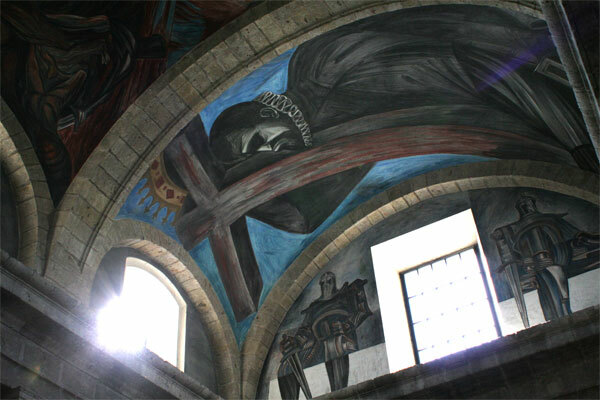 In all, there are fifty-seven murals in this chapel, which took Orozco, a native of the area, two years to complete. The murals bring to life the Spanish conquest, the boldness of the enterprise, and the sadness in its wake. They evoke spiritual and historical themes, and each panel animates a different story. I have long heard of these muralists of post-revolutionary Mexico, who created grand works in public places. But I had only previously seen their work in books and on TV. 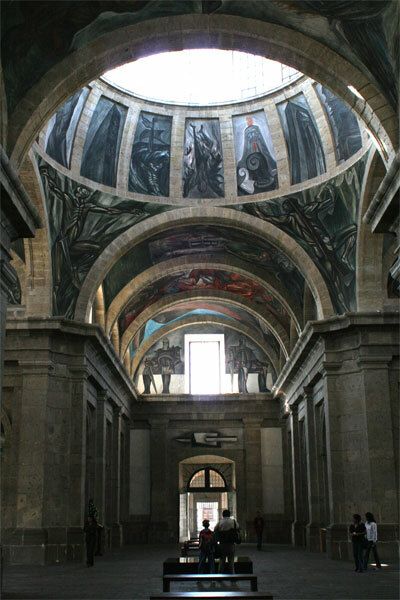 Now I want to come back to Mexico and see murals by the other two of the so-called Big Three in the genre: Rivera and Sequeiros. amazing, i actually studied music in the hospicio cabañas long ago when i was young and never noticed how wonderfull these murals were, im now a digital artist and a mediocre musician 🙂 go figure.